Do you have a class in Blackboard? Would you like to have access to high quality academic resources for online research? This quick video shows you how to find a link to academic resources from the Blackboard class menu. LibGuides (library guides) will take you to electronic resources in multiple formats including articles, e-Books, newspapers, videos, and more. LibGuides are accessible 24/7 from a Smartphone, tablet, or computer. We’re back from break and back to our new, extended semester hours! The first floor of Carlson Library is open overnight five days a week… just use your Rocket Card to swipe into the library after midnight. Upper floors and the basement level close at 12 midnight on nights we’re open late. Sunday 9 a.m. – Friday at 6 p.m.
Friday 7:30 a.m. – 6 p.m.
See our University Libraries hours page for a full list of hours for individual services, as well as our holiday exceptions for Fall semester. The UT Libraries are making access to high quality research materials easier for students. Every Blackboard classroom now has a link in its menu to subject-specific LibGuides (library guides), providing students with an introduction to finding articles, e-Books, internet sources, textbooks, and more. LibGuides are available 24/7 from smartphone, tablet, or computer. 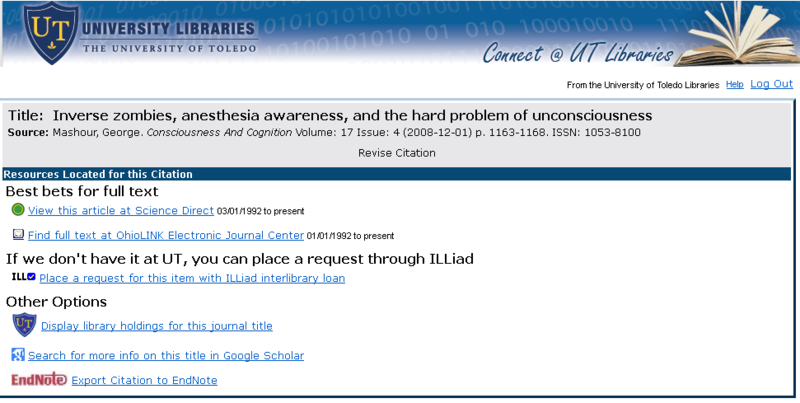 Instructors are invited to collaborate with a UT librarian to develop a LibGuide specifically for their class needs, otherwise students will be directed to a general subject guide, or to the University of Toledo LibGuides website. Contact a subject librarian to discuss possibilities. We’ve been making some changes behind the scenes to our Find It button, which you may have seen in many of our article databases. 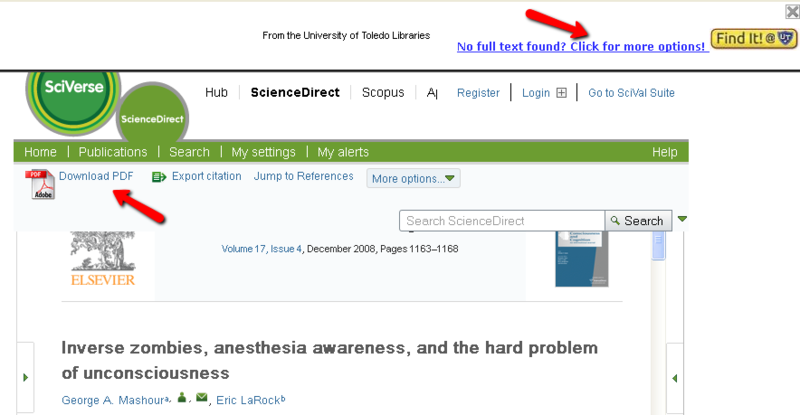 If you see in your search results, you can click on it to see if we have full text access to articles or to link to our library catalog and interlibrary loan request forms. We plan to include the updated Find It! button in all of our databases before the Fall semester begins, but you may see some of the old style links in some databases until we work with each database vendor to make the change. 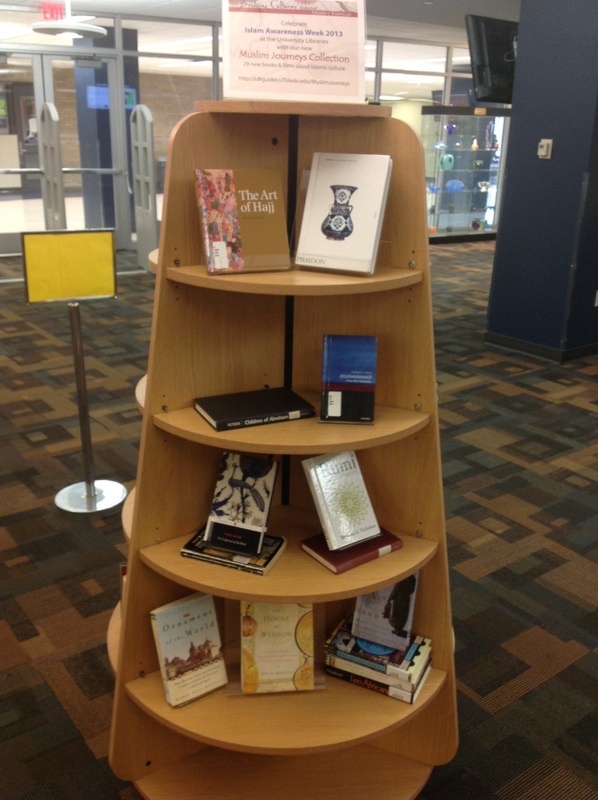 The University Libraries has recently received the Bridging Cultures Bookshelf: Muslim Journeys, a grant of twenty-five books and three films on aspects of Islamic culture and religion for our collections. During 2013, we will be presenting a variety of programs to feature these materials and the themes they represent. Our first program will be a book discussion of Children of Abraham: Judaism, Christianity, Islam co-sponsored with the UT-Muslim Students Association on March 19th at 6 p.m. in Student Union Room 2582. Other programs will include a lecture on Islamic Art by Carolyn Putney at the Toledo Museum of Art in September, and a film screening as part of the Toledo Lucas-County Public Library’s Film Focus series. A full calendar of events (including those at Owens College & Lourdes University, who also received the grant) is available on our Muslim Journeys LibGuide. Additional information about the collection, including introductory essays, discussion points, and related materials, is available on the LibGuide or at the Bridging Cultures Bookshelf site. 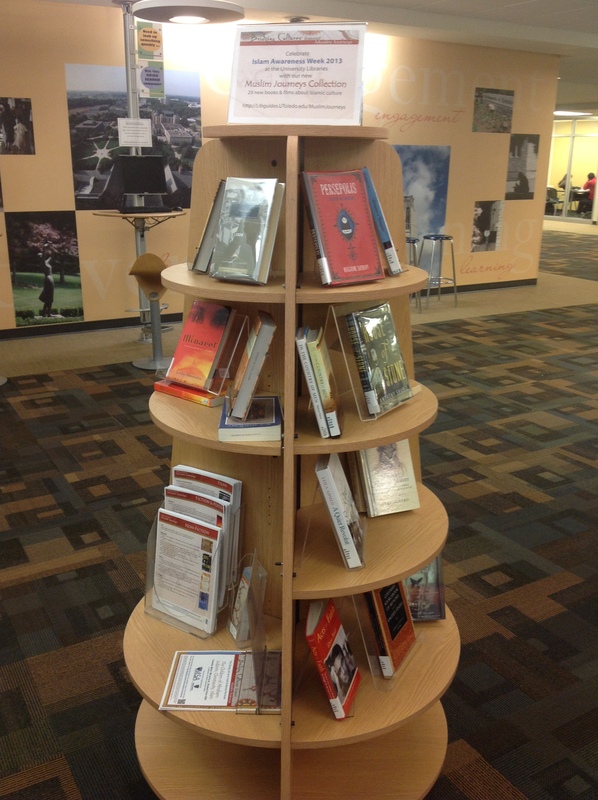 The Bridging Cultures Bookshelf: Muslim Journeys is a project of the National Endowment for the Humanities, conducted in cooperation with the American Library Association, the Ali Vural Ak Center for Global Islamic Studies at George Mason University, Oxford University Press, and Twin Cities Public Television. Support was provided by a grant from Carnegie Corporation of New York. Additional support for the arts and media components was provided by the Doris Duke Foundation for Islamic Art. Catalog & Database Lists Improved! We’re rolling out improvements to the look and functionality of two important library resources today! Click to see a larger screenshot with explanations. The library catalog will get a new look… now your search will bring up the most relevant materials to the top of your search, and you’ll be able to further refine your search by location, format, date, etc. using the menus at the left. 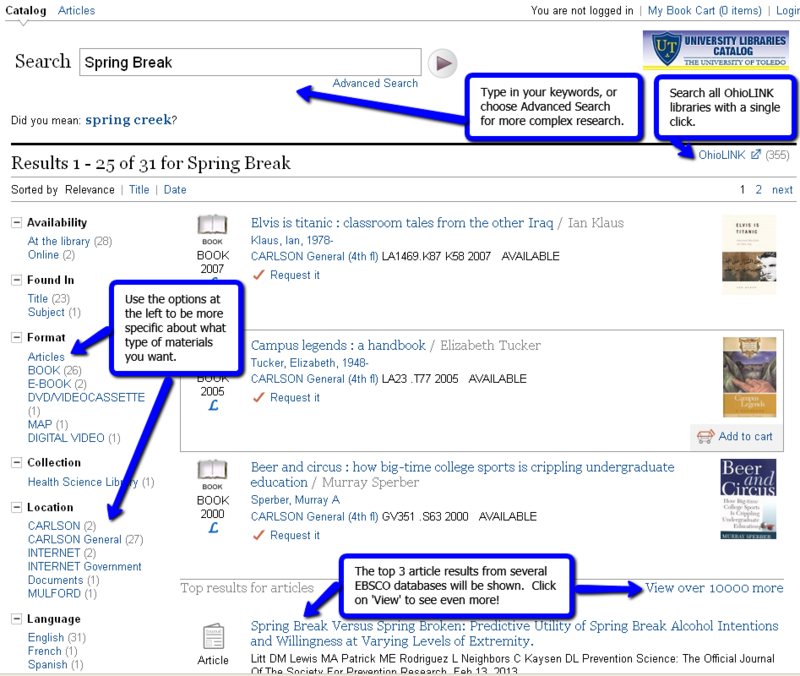 Also new is one step searching for articles, right from the catalog search results. This brings almost all of our materials– books, articles, DVDs, and much more–into a single easy search. Check it out today! The old version of the library catalog is still available for searching, too. The other major improvement is to our list of research databases and other electronic resources. Our new page features an alphabetical menu across the top and an expanded menu of subject categories. All databases are listed, including those that we get through OhioLINK and those that we purchase just for University of Toledo users. Signing in from off campus is easy–just use your name and Rocket ID number, including the ‘R’ at the beginning. If you have any comments on these changes, please let us know either here in the blog or at AskIt@utnet.utoledo.edu. You may contact librarians in person (via the Circulation Desk), or by phone, email or chat (see “General Information” for contact details, left-hand side of page). If chat is closed or if a librarian is unavailable, please feel free to leave a voice message or an email and we will respond as soon as we can. 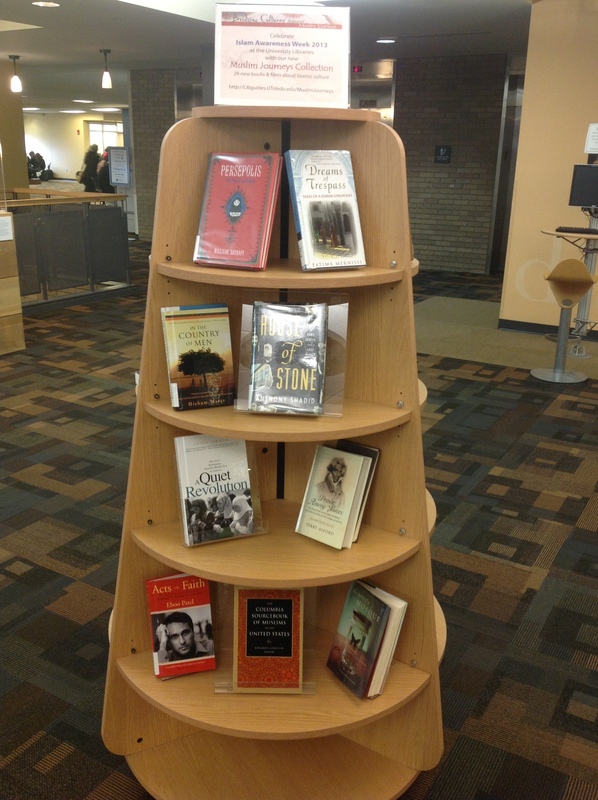 The staff at the Circulation Desk will also be happy to assist you with certain requests. Finals week hours & Study Bash! Carlson library will be extending their hours to provide for additional study opportunities during and before exams. The entire library will be open until Midnight both Friday & Saturday before the exams (December 7th & 8th). The upper floors will also stay open later Sunday through Wednesday to accommodate additional student need; staying open until 2 a.m. on Sunday, Tuesday & Wednesday, and 3 a.m. on Monday. As usual, the first floor Information Commons will remain open 24 hours from Sunday noon until Friday evening. Please stop by the 2nd floor Learning Commons on Monday, December 10th for a Study Bash from 3 p.m. until 3 a.m. Student Government will be giving away gift cards each hour, and massages will be available from 4-6 p.m.
We wish you all the best as you study for your finals! Wednesday: Open until 7 p.m.
Saturday: Open Regular Hours, 11 a.m. – 7 p.m.
A complete list of regular and holiday hours is available on the UT Libraries website.